how to graph exponential functions by plotting points. the characteristics of graphs of exponential functions. how to use transformations to graph an exponential function. The general form of an exponential function is y = bn, where b > 0 and b ≠ 1 and n is a real number. Draw the graph of y = 3x for –1 ≤ x ≤ 2. 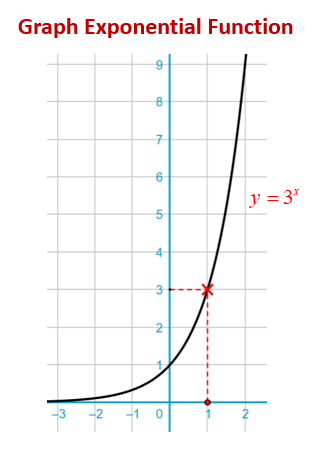 The following diagram shows the graph of the exponential function y = 3x. Scroll down the page for more examples and solutions on how to graph exponential functions. In this video, we look at how to graph an exponential function by plotting points. a) As the value of x increases, the value of y increases far more than the increase of value of x.
b) The range (or values of y) are positve real numbers (never zero). c) The graph is asymptotic to the x-axis that is it gets very close to the x-axis but does not touch it or cross it. This video gives the properties of exponential functions (where b >1). This video gives the properties of exponential functions (where 0 < b <1). The following video shows how to use transformations to graph an exponential function. How to graph exponential functions that have been transformed (shifted up or down, left or right, and perhaps even reflected)?